This blog post aims to (a) illustrate my why in sports for development and peace and (b) not to dwell on my past but to live in the moment, not after the moment as much as possible. I write from Abu Dhabi International Airport in the United Arab Emirates, en route to India to spend time with my elderly grandparents in Kerala. Abu Dhabi is a place I have fond memories from my childhood. The Al Khubairat Community School (now known as the British School of Al-Khubairat – BSAK – which is celebrating its 50th golden Anniversary this year) is where I attended elementary school and participated in my first sports day. 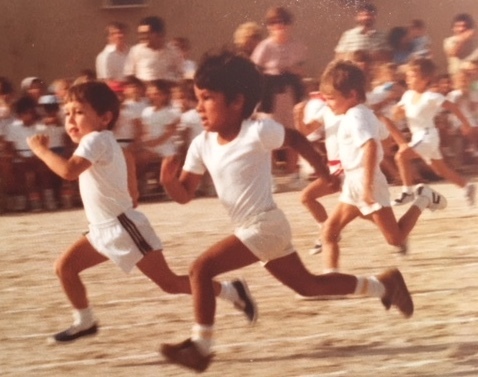 Lee (a Scottish classmate) and myself at the Al Khubairat School Sports Day, Abu Dhabi, 1980s. I don’t know exactly how old I was in the photo above but it represents the beginning of my athletic journey. I always enjoyed my PE classes and the teachers who led us from from primary to higher education. I don’t remember all the details and lessons plans that our teachers used but they used a constructivist approach to help us progress through various stages of physical and psychosocial development. Even though I am not currently a parent, I have a greater appreciation of the role of teachers at different stages of a person’s lifespan and how they can influence a person’s health and wellness trajectory. Ooty Track and Field Trip with Mr. Sither, 1990s. My onward flight is to Kerala which reminds me of trips to Kodaikanal International School. 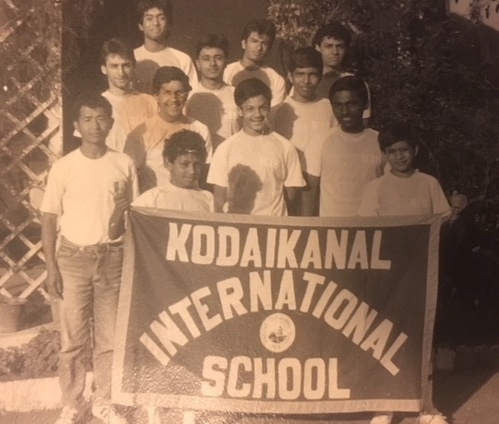 The above photo was taken from my first first field trip to participate in Inter School Sports for The English Speaking Schools of the Nilgiris in 1989. Mr. Sither (retd. PE teacher) was our chaperone and is a teacher who had a positive influence on my athletic development. 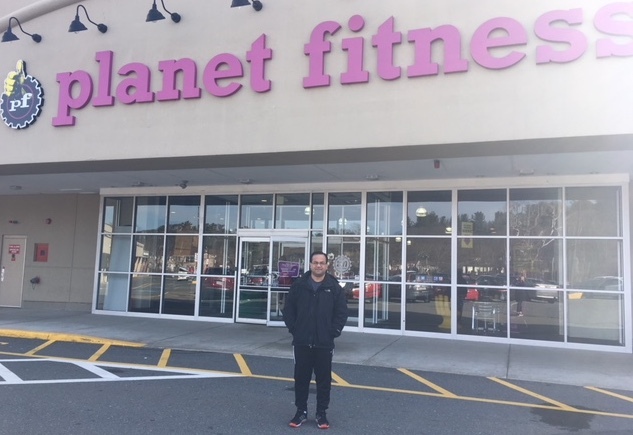 Besides my PE teachers, my fellow competitors like Lee in Abu Dhabi and student-athletes in the Nilgiris and elsewhere, all motivated to aim for self-improvement in sport and life. I feel like my travels, has me running to stand still. As the world remembers Nelson Mandela’s 100th birthday, we are reminded of his important impact in the world of sport and leadership. 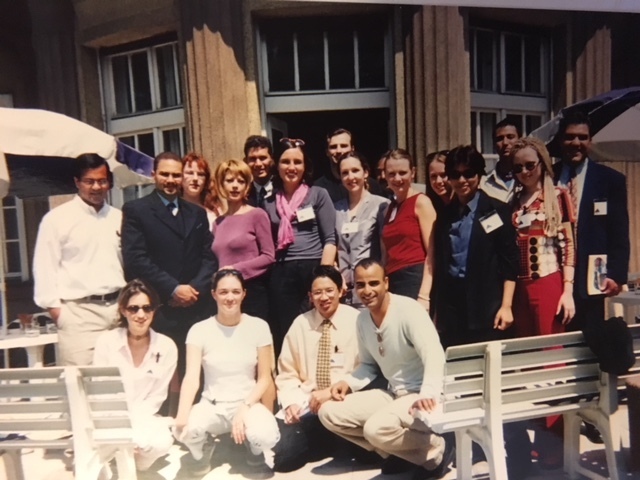 A year after Mandela gave his speech on the power of sport at the first Laureus Awards event in Monaco, 2000, I was fortunate to volunteer as a Facilitator with Civic Concepts International in Prague, Czech Republic. 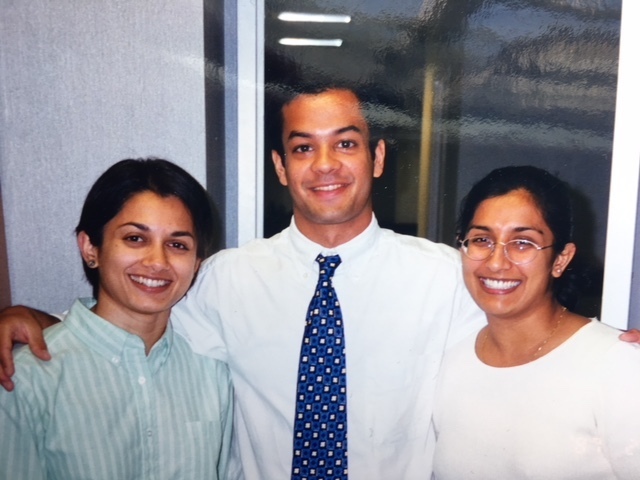 By participating, speaking and facilitating at the 2001 International Youth Leadership Conference, this was not only my first overseas trip as an American citizen, but it was the first time I was an international volunteer in what was to me a new region of the world. 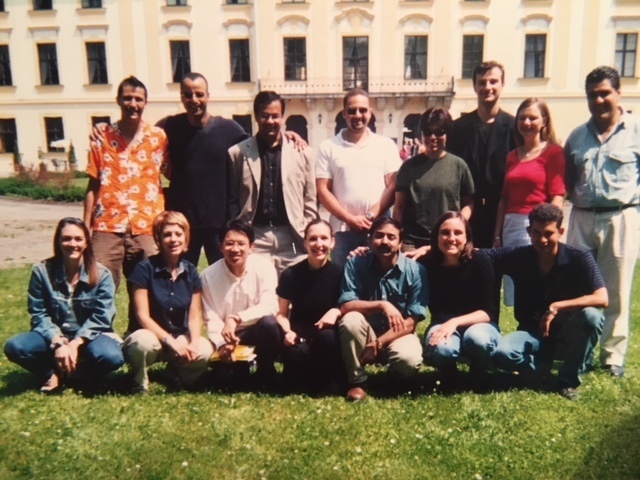 Tariq Mohammed and participants at the 2001 International Youth Leadership Conference in Prague, Czech Republic. 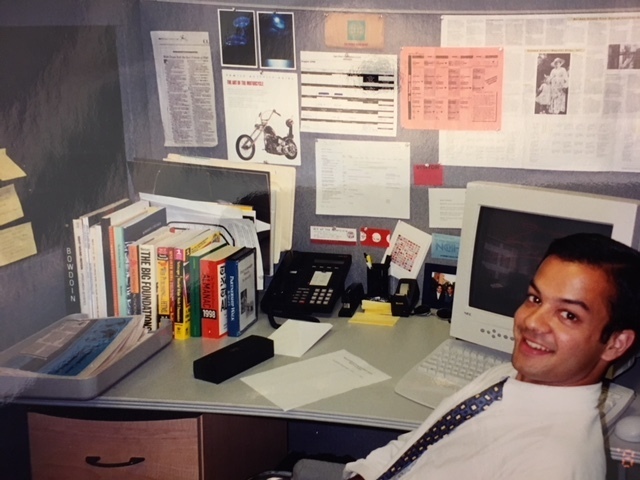 Photo credit: W. Webster, 2001. Our role as facilitators were to create a positive and inclusive environment for cross-cultural learning and dialogue on political and economic crisis simulations. The facilitators also acted as chaperones for the participants on social and cultural excursions. For example, my group (see photo above) visited the Japanese Embassy, toured Radio Free Europe/ Radio Liberty and ate an authentic Czech meal. The combination of activities fostered a genuine exchange of ideas and modes of cooperation. It was not always easy to find solutions during the crisis simulations given different points of view, however by practicing mutual dialogue, negotiation and advocacy skills participants were better equipped to tackle real political, economic and social issues when they returned to their countries of origin. Embassy Visit of 2001 International Youth Leadership Conference Participants, Prague Czech Republic Photo credit. W. Webster, 2001. If you are a parent, educator or coach of a recent college graduate, I recommend that you nominate a young individual to participate in forums such as the International Youth Leadership Conference which currently hosts events in the Middle East, Africa, Asia and of course Eastern Europe. In addition to the skill-building activities, there are opportunities to network with leaders from all walks of life and explore a new part of the world to gain a different perspective on your own beliefs and values. If we are to truly create the world that Nelson Mandela envisioned for the future, then today’s youth might want to consider participating in an International Youth Leadership Conference close to you. How Can Civic Media Influence Sport for Development and Peace? On a recent trip to Southern California, I posted an announcement on my social media account about prepping for travel to the Greater Los Angeles area. In doing so, I expressed interest in meeting with business, government and civic leaders. I knew before leaving on the trip, I would be posting on my blog to share learnings with a wider audience through the lens of sport and culture. What I did not know was, what the content of producing the Youtube video below was going to be and how it might be relevant to sport for development and peace. Nonetheless, there was history and context behind my visit. My Dad was a salesman in the Middle East and won a competition for selling Uncle Ben’s Rice in his sales territory. Hence, my parents were awarded tickets to watch the 1984 Summer Olympics in Los Angeles. Then in 1993, my parents, sisters and I visited California on a family vacation before we immigrated to the United States in the late 1990s. During the summer of 1984, Miriam, my sister and I stayed in Andover, MA with the Hazarika family. One afternoon, I clearly remember watching Joan Benoit Samuelson on television, become the first American woman to win the inaugural women’s marathon event. Moving forward, Los Angeles will host the 2028 Olympics and so there are elements of the video that illustrate the business, government and civic institutions in Los Angeles today. I did not have any official meetings with the representatives that I had hoped for, but still was able to conduct a civic media project for myself through low-budget and low-tech video production. This was done on a day by day basis due to disappointing weather conditions early on in the trip. However things, brightened up both, literally and figuratively, when I reconnected with former classmates from India and the Middle East, discovered new places in California and learned about different cultures, all without leaving the United States (for a change). What did I learn and how can it help others move forward? Well, thanks to Professor Colin Miles Maclay, a former colleague at Harvard and now Director of the Annenberg Innovation Lab at the University of Southern California for helping me (without knowing it) that I have been producing various civic media outputs on Youtube for the benefit of being able to (a) to practice active citizenship (b) foster greater understanding of the United States vis-a-vis the rest of the world (c) create fun memories for myself and others to enjoy. What Role Can ICTs Play to Improve Sport Governance? In 2001, the International Year of Volunteers, Kofi Annan, former Secretary General of the United Nations, stated that “volunteerism is the ultimate expression of what the United Nations is all about.” Fifteen years ago, in 2003, I set forth from Boston, Massachusetts on my United Nations Volunteer assignment in Kampala, Uganda under the auspices of the United Nations Information Technology Service (UNITeS) – an initiative envisioned by the Secretary General – to support efforts to bridge the global digital divide. Since returning from my UNV assignment, I continued to be engaged with various volunteer projects in the United States and across the world, with an emphasis on sport for development and peace. Upon re-reading my 2002 personal statement to the Cisco Least Developed Countries (LDC) Initiative of which UNITeS was a key partner, I am glad to have been asked by the hiring managers to undertake such a writing exercise. Any hiring manager who wants to narrow down their selection of strong candidates, would do well to request a personal statement. Not only does this tool allow for benchmarking but it can also help individuals (and organizations) set future goals. I am making my personal statement public for the purpose of knowledge management to improve education and learning while addressing the challenges of sustainable development, of which ICTs play an important role. 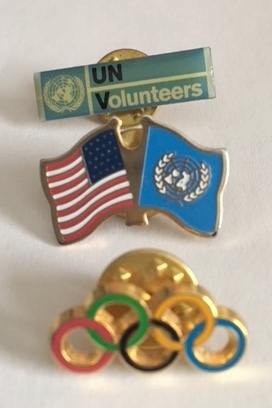 My Pin Collection from United Nations Volunteers (UNV), United Nations Development Programme (UNDP) and International Olympic Committee (IOC). Photo credit: T.Mohammed, 2018. In 2018, major news headlines posed big questions about democratic freedoms and the role of the Internet and social media. Through the Kofi Annan Foundation, Kofi Annan founded the Global Commission on Elections, Democracy and Security and recently published an op-ed which addressed the challenges to the integrity of the electoral process for high-income and low-income countries. The findings of the Commission will be released in the coming months. While I have no direct contact with inner workings of the Foundation, the outcomes from the Global Commission can have a significant influence on the political, economic and social systems of international sport governance. Sport for development and peace is very much at the heart of democratic institutions, such as the International Olympic Committee which strives to promote universal values enshrined in the Olympic Charter. The role of the Internet and social media are often described as tools to provide access to information on programs and projects that uphold Olympic values. I do believe that greater access to information and transparency preserve the integrity of the sport for development and peace sector. However, I also believe in the need for a system of checks and balances in the areas of corruption, terrorism and crime, which the International Center for Sport Security (ICSS) aims to fulfill. ICSS and its partners are identifying weaknesses in systems of sport governance and leveraging ICTs to protect and serve the cause of peace, development and human rights. The Internet and social media will continue to evolve and so citizens will learn to adapt to new ways of living, working and playing.